After you’ve decided to come to Vienna (GOOD CHOICE! ;)), you obviously need a place to stay. Finding housing in Vienna can be difficult. You shouldn’t underestimate the time it takes to find a suitable flat and to undergo all the necessary steps. In the preparation phase, at home, you should make sure to have a checklist ready of the desired features of your future home, such as the location, the maximum budget for rent and guarantee, proximity to transportation or university, etc. It is always a good idea to arrange something beforehand. 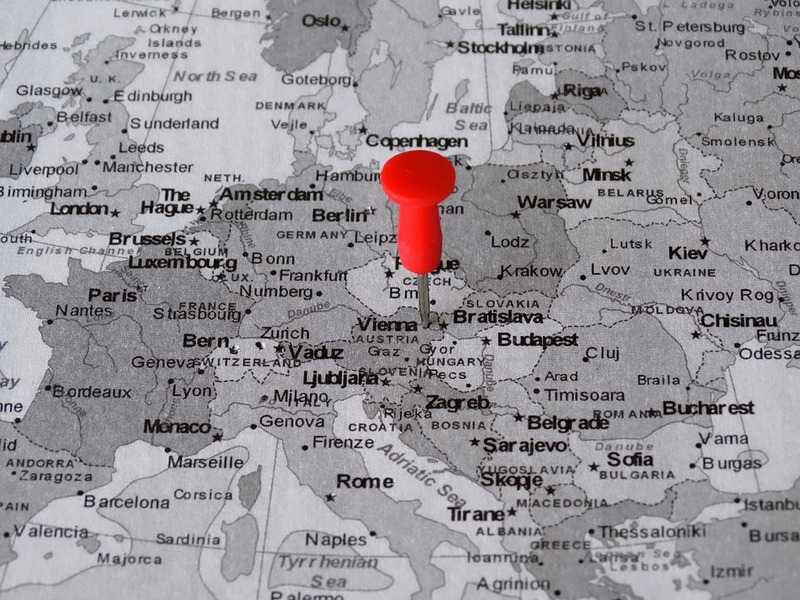 That way you can rest assured that you have a place to go to when you arrive and you can make sure that you’re not spending your weekly budget on one night in a very expensive hotel, for example. In this matter, you have several options. Vienna is divided into 23 districts. In Vienna’s center, you can find districts 1-9 or the “inner districts”, surrounded by the Gürtel. The first district is the most central district of Vienna and used to be surrounded by city walls, the outlines of which are still followed by the Ringstraβe. Back in the day, only this walled part was considered Vienna’s center, which explains why districts 2-9 are still called Vorstädte (suburbs), although they are now central and densely populated parts of Vienna. In addition there are the districts 10-23 or the “outer districts”. Below, you can find a rough description of each of the districts. Please note that these descriptions only give you a general idea of Vienna’s districts and note there are also many differences within the districts. 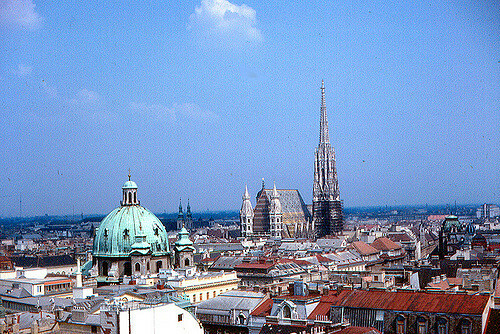 The 1st district, also called Innere Stadt, is the oldest and most central district of Vienna. Here, you can find the historic city center, surrounded by the Ringstraβe. The numerous historical sites and sightseeing landmarks attract tourists like a magnet. In addition, the first district is also the political, administrative and economic center of Vienna. All of this leaves little room for accommodation or residents, turning the first district into the most exclusive and also most expensive district to live in. Finding long-term accommodation here will be an enormous challenge. Situated between the Danube and the Danube Canal, there is the 2nd district, also known as Leopoldstadt. Thanks to the Prater Park, a big part of the district consists of green space. The Prater itself – an amusement park, mostly famous for its giant Ferris wheel – also has its charm. Right next to the Prater, there’s also the Ernst-Happl-football stadium, the biggest stadium of Austria and home to Rapid Wien. Furthermore it is the official venue for national football games, games of the UEFA-Cup and the Champions League. Because of the low real estate prices, the district is mostly populated by immigrants and students. However, be aware that there are some small areas around the Messe Wien or along the Handelskai where you should be careful at night. Landstraβe, Vienna’s 3rd district, is located on the right bank of the Danube. The Belvedere and the Hundertwasserhaus are some of the most popular tourist attractions in this district. The district is mostly urban and populated by the working-class, apart from the diplomatic quarter, a small section of the third district where you can find several embassies. Vienna’s 4th district, Wieden, is a small neighbourhood south of the first district, but just as fashionable. It consists largely of residential areas. Karlsplatz is probably the most lively area in this district, also famous for the Karlskirche, although Naschmarkt – Vienna’s biggest fresh food market – is pretty cool too. This area is in general a little bit more upscale than the surrounding 3rd and 5th district, but there are some ugly blotches here and there. In between the Gürtel und the Wienzeile (Street along the Wienfluss), you can find Margareten. With its narrow streets and only little green, the 5th district is one of the cheapest districts to live in. Wieden and Margareten used to be one district, but they separated due to their reputations. Wieden was considered a nice part of Vienna, whereas Margareten was thought to stand diminishing Wieden’s prestige. Until the 1990s, Margareten’s reputation deteriorated, but recently there have been some successful revitalization projects. Although not having overcome its dark past entirely, it is now a reasonably-priced, well connected area to live in. Vienna’s longest shopping street, Mariahilferstraβe is located in the 6th district, accordingly named Mariahilf. The impressive Haus des Meeres is only a stone throw away and offers you an amazing view over the city. The surrounding area is packed with small eateries, cafes, theaters and pubs, attracting mostly a young and hip audience to Mariahilf’s streets. On the other side of Mariahilferstraβe, you can find the 7th district. It might not look green from the outside, but almost every building has a courtyard, so you’ll have a green space right at your fingertips. Neubau is just as trendy as Mariahilf, but offers some smaller bars and shops. Thanks to MuseumsQuartier, Neubau has a vibrant cultural community, appreciated by both young and old. Josefstadt, named after Habsburg Emperor Joseph II, is Vienna’s smallest district. The 8th district is situated near the the Parlament, the Rathaus and the University. This quiet and friendly neighbourhood houses charming cafes, restaurants and shops as well as elaborate monuments and churches, and even the Josefstadttheater. This contributes to the popularity of its residential area, you will notice that in your wallet. The 9th district, Alsergrund, is sometimes referred to as the academic quarter, because of the proximity of the university, the existence of many hospitals and clinics, and the presence of Sigmund Freud’s house. You can also find the Museum of Modern Art (WUK) here, where they have exhibitions and sometimes even parties, attended by a hip crowd. Favoriten, the 10th district, has the largest population of Vienna’s districts. In Austrian terms, this is kind of a “bad” district, but compared to other metropoles, it is actually okay. There is not a lot to see here, but the proximity to the “Wien Hauptbahnhof” Station is a huge advantage for the 150,000 people that call Favoriten home. Despite the presence of Hauptbahnhof and quite some green spaces in the area of Oberlaa, this is one of the cheapest districts concerning real estate. Bordering Landstraβe and housing the last stop of the U3, Simmering is rather busy in the North, while suburban if not rural in the South. However, at the southern border of the 11th district you also get access to Vienna’s airport Schwechat and the Viennese woods at the onset of the National Park Donau-auen. Within the district itself, there is not a lot to see, but there is a lot of green. You can also find Vienna’s main cemetery “Zentralfriedhof” here. Nevertheless, Simmering is also one of the cheaper districts, dominated by flats that are generally inhabited by the working class. You will recognize someone who was born in Meidling through his/her pronunciation of the letter L: a “Meidlinger L” is pronounced like in Czech. Predominantly, these people will be labourers, as the 12th district is yet another working class suburb. However, there are some upmarket real-estate opportunities here and there. The greenest district in Vienna is the 13th: 72% of Hietzing consists of parks, forests and other green areas. It has attracted a very specific crowd: highly educated, elder Austrians with an unusually high income. Hietzing is mostly famous for one of Vienna’s main attractions Schloss Schönbrunn, but actually the heritage of the wealthy Habsburgers is still present throughout the entire district. Penzing no longer belongs to Hietzing, but the 14th district is still worth your while. Almost 50% of the district is taken up by the forests of the Wienerwald and Penzing’s amazing suburban flair will make you forget about the city – although it is actually pretty close by. However, you should be aware that if you are very close to the railway or the Gürtel, there might be a lot of noise. You can find remarkably cheap real estate in the 15th district Fünfhaus, probably because of its horrible reputation, including stories about punks, prostitution or drug traffic. Although it is maybe not the nicest district, these stories are an exaggeration. The district is multicultural and very diverse, which indeed results in some nicer and shabbier areas (especially near the Gürtel), but within Vienna, it is actually safe to live anywhere, especially compared to many other cities. The 16th district is the birthplace of three products that are very typical to Austria: Manner Schnitten, Meinl coffee and Ottakringer beer. Nevertheless, Ottakringer is mainly inhabited by immigrants. Nowadays, Ottakring only has half the population it had a century ago, resulting in low rent prices. Ottakring has somewhat of a dubious reputation as well, but it’s really not bad. It has very charming areas, especially in the West, and the area around the Ottakring cemetery is even very pricey with many luxurious villas! Describing the personality of the 17th district is very hard, since it seems to lack a real personality. The areas range from “bad” (only for Viennese standards!) to great, resulting in low, intermediate or high prices for accommodation and the residents are socially and ethnically mixed. In any case, the Wienerwald occupies more than half of Hernals, making it a great place to live for people who love the forest. The 18th district, Währing, is predominantly residential and doesn’t offer a lot of sightseeing opportunities. Nevertheless, it has a lot of green and it is known to be rather up-market regarding real estate. It is, for example, inhabited by many doctors who work in the hospitals of the 9th district, just across the Gürtel. Döbling, Vienna’s 19th district, is perceived as even more posh than the imperial Hietzing. “Bling Bling Döbling” looks very exclusive, if not snobbish, at a first glance, but actually middle-class families and students live here just as well. Brigittenau is situated on the same island as Leopoldstadt and actually belonged to Leopoldstadt until the 1900s, but then got separated. Just over 20% of the 20th district consists of canals from the Danube or the Danube Canal, making it a particularly watery district. 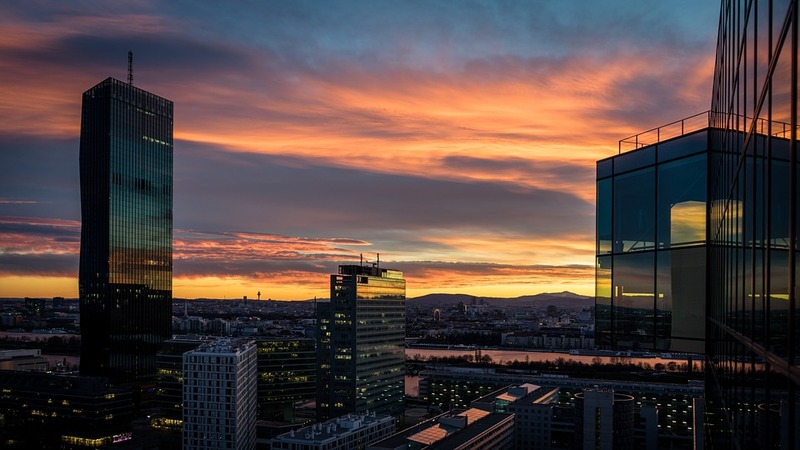 Sightseeing opportunities are limited here, but they do have one of Vienna’s only skyscrapers: the Millenniums Tower. Apart from this tower, the district recently created many office spaces. Real estate prices are relatively cheap. The 21st district, Florisdorf, and the 22nd Donaustadt are the only two districts on the “other side” of the Danube, earning them the name Transdanubien. Both districts are really big and together they comprise the biggest lake of Vienna: Alte Donau. There are only few touristic attractions here and due to their location, these districts are very often ignored by international tourists. However, many expats live in this area near the UN and some international schools. Being on the “wrong” side of the Danube results in affordable housing prices. Vienna’s last district, Liesing, is mostly urban and commercial. Concerning sightseeing, this district can be skipped easily as it just doesn’t have a lot to offer. It’s the district that is the least-densely populated and public transportation is not very good. You are pretty far away from everything.